Smart Watches, Elec.BGS Bluetooth Touch Screen Smartwatch with Camera SIM/TF Card Pedometer Sports Fitness Tracker Smart Wrist for Android Samsung Huawei Sony (All Function) and iPhone(Part Function) | The Best Spy Tech Store Online! [Multi-Function Smart Watch] :Calendar, Camera, Pedometer Analysis, Calories Calculation, Sleep Monitoring, Bluetooth, Remote Photos, Music Playing, Alarm Clock, Intelligent Anti-lost, Voice Recorder, Muti-timezone, Muti-language, daylight saving time and notification push including facebook,twitter,email,calls,texts,etc. For ANDROID,all functions can be used. For iPhone,the smartwatch supports Partial Functions. [Material Comfortable]:Highly sensitive capacitive IPS HD 1.54 inch touch screen display with 240 * 240 resolution. hypersensitive screen touch, which can supply you the clear display even in the glare. STAINLESS STEEL surface, precision lamination process, Nano TPU85 material tape, anti-sweat matte surface treatment, ergonomic convex design and soft strap which make wearing more comfortable. [Broad Compatibility]: Android Mobile Phone: Samsung, HTC, Sony, LG, HUAWEI, ZTE, OPPO, XIAOMI, and so on. iOS Mobile Phone:iPhone x;iPhone 8;iPhone 8 Plus; iPhone 7; iPhone 7 Plus; iPhone 6/6s; iPhone 6/6s Plus;, iPhone 5/5S; iPhone 5C etc. (This APP can’ t be installed by iOS,IOS system can’ t sync SMS and Bluetooth push information, but other functions can be used by iPhone). [Long-Lasting Battery life]: Built in low power consumption Bluetooth chip, sensor and 380Mah rechargeable battery.In the USB port of the computer or the portable power bank etc Full charge about 45 minutes and use time about 3 days. And it can be a perfect gift, to friends to kids to lovers to parents. 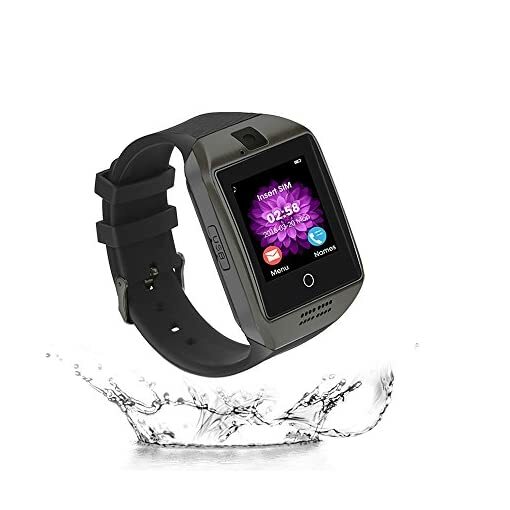 [Easy to Use]: Insert SIM card (frequency: GSM 850/900/1800/1900 MHz) and TF card (maximum 32GB) to use it as a Standalone Phone Watch ; Connect it with a smartphone via Bluetooth to use it as a Bluetooth Smartwatch. And Waterproof, the smartwatch surface can resist rainwater impact when you are in outdooor.